Love Inspired brings you three new titles for one great price, available now! Enjoy these uplifting contemporary romances of faith, forgiveness and hope. 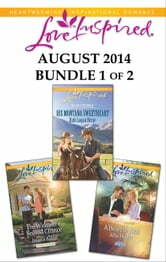 This Love Inspired bundle includes His Montana Sweetheart by Ruth Logan Herne, A Heart to Heal by Allie Pleiter and The Widower’s Second Chance by Jessica Keller.